Night School Studio’s OXENFREE has been on my radar since it released on PC and consoles last year to accolades from both the press and players alike. I didn’t want to be spoiled, so I only learned enough about it to think that it looked like something that would play perfectly on an iPad. Since there was no word on that ever happening, I grabbed it for my PC during a holiday sale, knowing full well I may never get to it because I don’t like playing games on my PC. I only booted it up to test the connection between my laptop and my new TV. And from those first few minutes, I was actually a little worried I might not like it. It starts off with lots of dialogue and my character, Alex, offered me three speech bubbles to pick from, which disappeared if I didn’t choose quickly. With a mouse, this felt rushed and I wasn’t compelled to continue playing it just then. So when the game surprised me with an iOS release, I have to admit I hesitated just a bit before buying it again. I had just come off a few dialogue-heavy games that I wasn’t enjoying and I was nervous about starting another one, especially if it was going to rush me. But it ended up being one of the most enjoyable narrative, point-and-click adventures I’ve experienced in a long time. I don’t want to say too much about the plot because that will ruin all the fun. But luckily, there’s plenty to discuss without spoiling that. What I can tell you is that the story follows a small group of friends just about college age taking a trip to Edwards Island, a place some of them used to frequent as kids but never together as a group. They’ve also never spent the night until now. As you might guess, some weird things happen as they’re alone on this island, but I’ll let you discover that for yourself. You play as Alex, a blue-haired girl who is pretty good with radios and brought one with her. The controls are streamlined for touch screens, with either tap-to-move or tap-and-hold to lead Alex where you want her to go. There are white circles that indicate interactive spots and if you get near one, the option to interact will pop up. This can be talking to someone, inspecting an item, or continuing to the next area. To use the radio, you just tap the icon in the upper right corner and then swipe left or right to change the station. It’s useful for tuning in to the island’s radio station to learn about its history near certain landmarks, but it actually serves a much bigger purpose. As you play, you’ll be able to tune it to hear all sorts of stuff, some necessary to continue and others optional. If you race through the game, you can actually miss quite a bit of the extras and even some of the main story and wind up a little confused at the end. But I’ll talk more about that later. Edwards Island is fairly small but can feel bigger when you’re walking around on it. On my first play-through I got lost quite a bit, despite glancing at the map frequently. I have a terrible sense of direction, so I’m sure that played a part in it. But luckily the environments are a treat to look at and there’s plenty to keep you occupied while you walk from location to location. The main source of entertainment while you’re walking is the dialogue. Once in a while, a game comes along that does something that works so well for the genre that it makes me wonder why I haven’t seen it done before and wish that other games will follow suit. 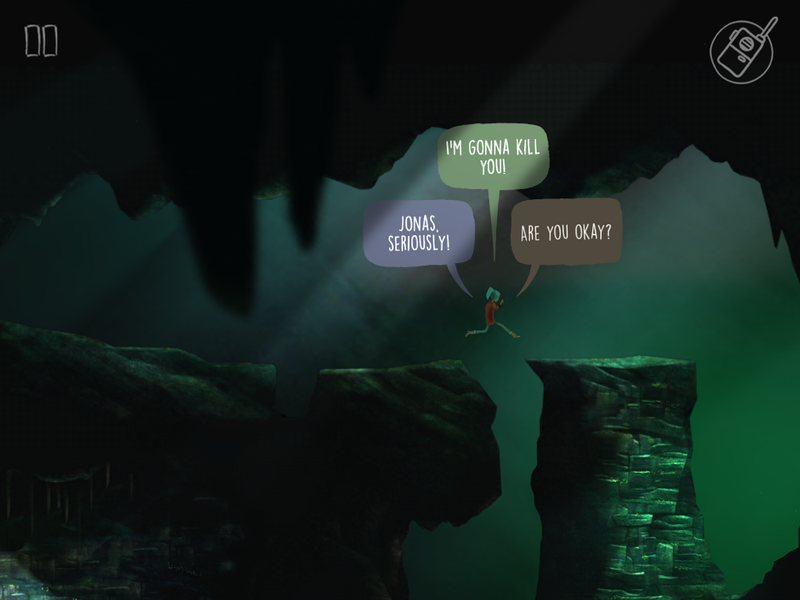 In OXENFREE, that thing is walking and talking at the same time. I have not been able to get into the Telltale games, as I find them stressful for narrative games. I don’t like having to deal with quick time events (QTEs) or making split-second decisions that affect my whole experience. But with OXENFREE, I couldn’t see it any other way. It works differently than other games, in that the characters talk while they’re walking. You don’t just stand in front of them and tap them to make them talk. The conversation automatically happens and you can decide join in or opt out completely. Your friends will continue talking even if you don’t, but they’ll respond to your silence. It feels organic, like you’re roaming the woods having a conversation with some friends (and forgive me — frenemies). Some of it is silly, meaningless banter, but they also discuss deep, emotional and relationship issues. And, of course they discuss the plot. Which I won’t. Even if I want to. But it all blends seamlessly together so it feels less forced and less scripted than other adventure games. Even if I didn’t relate to these characters in every way, I could relate to the experience. I say stupid things with close friends when I’m not worried about being judged. And a lot of the dialogue here is like that. Occasionally, it does feel like Alex interrupts when I wanted to hear what her friends were saying, and I have mixed feelings about that. Perhaps the point of it is that you don’t always have to speak just because you can. But the gist of it is that it all feels very natural. As someone who has been getting tired of dialogue-heavy games, I absolutely adored it here. In fact, the walking only really felt tedious when there was a break in the dialogue and I had to walk in silence. That said, some may find the dialogue annoying and if that’s you, you’re not going to enjoy the game because there is a lot of it. If you’re not sure, I recommend watching a little bit of my video below. It will give you an idea of what the conversations are like without spoiling the story. This gives you a little idea of what the characters are like and whether you like their banter or would find it too off-putting to enjoy. But please do give it more than a few minutes before making your decision. Even if a character annoys you in the beginning, I think they can grow on you. It also helps to remember that friends can sometimes be annoying, but that doesn’t mean you should abandon them. If all these characters were perfect, they’d be boring and far less relatable. The only other reason I might tell you to avoid the game is if you only have an iPhone and you think it might be too small and uncomfortable to play on there. This will come down to personal preference and level of tolerance. If you have an iPad, I would recommend playing on there, without a doubt. Unfortunately, the game does not have iCloud sync, so you have to choose one, and it is definitely more enjoyable on a bigger screen. I played a little bit on iPhone just to see how it is. I wouldn’t choose to play on the smaller screen when I have a larger one, but from what I’ve played it seems perfectly doable if that’s your only option. The game does make interactive spots easier to find by marking them with little circles, so it should be less problematic than if you had to pixel hunt. Either way, be aware that this is not a mobile game that you play in bite-sized chunks. The game only saves when you enter a new area of the map, so if you take a break in the middle of a scene, you’ll have to repeat anything that happened since your last save point. The best way to play is to carve out an hour or two each evening and get fully engrossed in the game. The benefit of having it on iOS is that you get to play it on a more intimate platform than with a controller or a mouse. If you have an iPad, I can’t think of a better way to play this game. It’s also cheaper than on PC. I played through the game twice on my iPad Air 2 and it felt great aside from a few control issues — like Alex moving when you choose a dialogue option or getting stuck while climbing — and the occasional bug. But none of the bugs or issues were game-breaking. As I said, I played through the game twice. Normally I wouldn’t really want to do that unless I’m making a walkthrough, as there are so many games in my backlog and no one has shared their cloning technology or immortality elixir with me yet. So playing through a four- to seven-hour game again just for fun is not common for me. 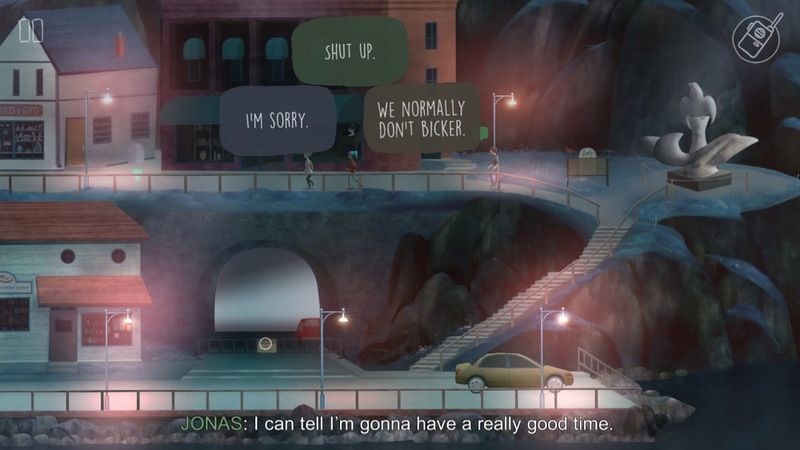 But in OXENFREE, some things are different on your second play-through and there’s also an ending that’s not possible to get the first time around. On top of that, I mentioned I sped through the game too quickly. In my eagerness to find out what happens, I missed out on a whole bunch of letters scattered throughout the island which reveal quite a bit about the plot. I also missed a ton of easter eggs and other extras. So on my second trip around the island, I took my time and made sure I soaked in as much as I could before starting the final act. It might have been annoying to have to play a second time if nothing changed, but there were new cutscenes and enough changes to make it feel like an extension of my first game rather than a complete replay. I came out of it with a much better understanding of the plot, as well as a bigger appreciation of the game and all its little intricacies. If you do play it, I highly recommend taking that extra time and doing it again. I should say, though, that I started a third time out of curiosity and with the intention of possibly going in for some achievements I missed and just to see what else I could find. But even though I was able to get some new dialogue branches in the first half hour, it wasn’t satisfying enough to justify doing it all a third time. Luckily, I got the good ending and the ultimate super special ending on my second play-through, so I don’t have to go back in to try and get them. But had I not, I might have come away from the game a bit sour, since much of that comes down to decisions you make in the last act of the game. On PC, players could back up their save in case they choose wrong. But there is no way to do so on iOS and playing through the entire game just to make different choices in the last half hour would be far too tedious. So it would have been nice if, at least after a second play-through, the game could hold your place right before the last act. That would be a time-saving feature that would be much appreciated. I would even go back in to mess around just because there’s a lot of different things happening and I’d love to see everything in there. But I don’t see that happening as long as another entire play-through is required. I also have some bittersweet feelings about the timing of the iOS release. With most games, it doesn’t matter when you play it. But there’s so many hidden secrets and easter eggs in OXENFREE. Every time I found something, I wanted to share it with others and discuss it, get excited with other players. But anything I found was already discovered over a year ago by other players, making it far less exciting. And to pour salt in the wound, I found out that one of the meta-puzzles in the game led to a real-world scavenger hunt, which is now over, of course. You can learn more about it through video extras in the app, but it would have been nice to play the game while it was still possible to take part in it. This isn’t so much a criticism of the game as lamentation at so often being late to the party just because I prefer a touchscreen tablet in my lap instead of a keyboard and mouse. Overall, OXENFREE was one of the best narrative adventure games I’ve played. While it could certainly use some time-saving aspects for when you get lost in the forest or just want to look for things you missed, it’s very much worth your time and attention. The artwork, atmosphere, music, sound effects and voice acting all come together to create a completely immersive experience. It is light on puzzles if you only care about getting through the game and ignore all the extras. If you’re looking for a traditional point-and-click adventure with an inventory and puzzles every step of the way, this is not it. But it’s an experience unlike any other and I’m thrilled that I got to play it on something as intimate and comfortable as my iPad, even if it was a year later. If it does look like something you’d enjoy, please support it so maybe more PC developers will see that iOS is worth the effort. And maybe in the future we’ll get more games the same day as other platforms. 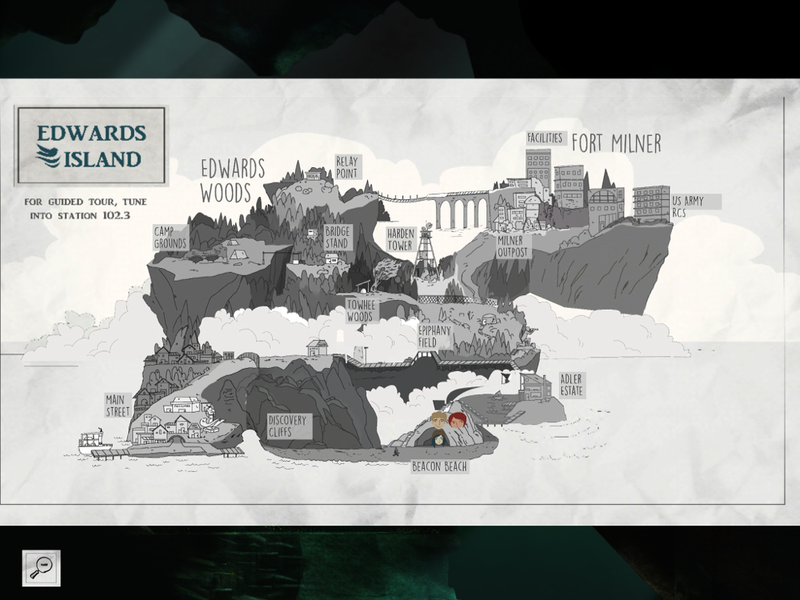 If you can’t wait to see what’s on Edwards Island, you can grab the game here. If you want to see more before deciding, you can try my complete video walkthrough here.